I had left instructions before going away a week prior to the meet for people to make their own arrangements and judging by my full inbox there were quite a few arrangements to be made. A few people had a premonition about the weather in advance of the meet, taking a cheeky day/week off before the rains returned in order to take advantage of the first properly summery weather since 2014. Ian had been up Beinn Maol Chalum, Bidean nam Bian and Stob Coire Sgreamhach from Dalness in Glen Etive. 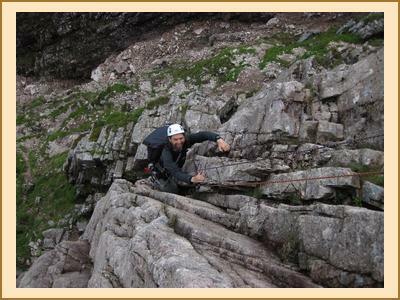 Keith and Shaun had been climbing Shackle route (severe) on Buachaille Etive Mor. 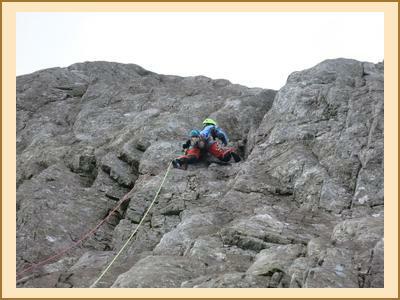 Alison did Groove Arête and Kenny had been camping near Killin. Thus Friday evening started with an early crowd basking in evening sunshine outside the hut; enjoying a drink before the midges came, swapping tales of the past few days and in Kenny’s case drying out a tent. Every now and then we would have to duck in order to allow the swallows who nest in the porch of the hut to deliver dinner to their rowdy offspring. True to its word the weather on Saturday was disgusting. There was a collective lie-in (except for Sylvian who had slept on the floor to avoid the heat on the upper bunks) and public jimjam-wearing went on until well into the morning. Ian, Keith and Tim went up Beinn Mhic-Mhonaidh (a Corbett in Glen Orchy) which Keith described as “a highly entertaining hill walk/jungle adventure”; Dave and Pauline went up Ben Fionnlaidh; and Marcus and Sylvian, both fuming as it really wasn’t a climbing day, headed to Buachaille Etive Beag, climbing Stob Dubh from the back and descending via the bealach, not realising there are two Munros on the wee Buachaille! Apparently there wasn’t much to see from the summits at all. Myself, Antti, Fiona, Mike, Alison and Fiona M went to the Ice Factor to climb and Fiona R picked up a bargain pair of orange stretchy trousers in the shop, which went perfectly with her green t-shirt to turn her into a climbing carrot. Antti and I, still buzzing after a week of extreme Munro-bagging, opted for midges and rain and returned to Lagangarbh on foot along the West Highland Way, getting a view shortly before the top of the Devil’s Staircase. Katrina (who was on the meet), t’other Clare and Monty (who weren’t) headed to Loch Etive to wild swim. Two of the party were swimming particularly wildly and one insisted on a full-body wetsuit. I shall leave readers to figure out who was who. Saturday evening was a genial affair of chat, pasta and Whack-a-Mole. Alison noticed a massive improvement in the quality of the alcoholic beverages – thanks mainly to Sylvian’s extensive cave. It has been pointed out that whilst Genepi and whisky count as quality beverages, Buckfast – although not tasting as bad as you might think – really doesn’t. Fiona R contributed “Mr Grippy” which is a hand dynamometer (it measures how strong your grip is) and a small-scale competition ensued between climbers, non-climbers and in-betweeners to find the strongest (Antti, it turns out). Margaret – a non-climber – wandered into the kitchen late in the evening to snaffle some cheese and won the Mr Grippy competition with a mature cheddar in her other hand. Sunday’s weather was a vast improvement on Saturday’s and along with the frantic packing and hut-cleansing there were some early starts before the weather set back in again. Alison, Kenny and Fiona M did January Jigsaw on the Buachaille, followed by Groove Arête (again for Alison) and carried on up to the summit whilst Kenny returned to the hut. Tim, Sylvian and Marcus were also on the Buachaille, having followed a small crowd up the Curved Ridge path from the hut. Pauline and Dave drove to Kinlochleven thinking of going up Stob Ban but instead tackled Stob coir' an Albannaich and Meall nan Eun from Glen Etive, having accidentally left Dave’s wallet and phone at the hut. Antti and I completed our hill-a-day week with a jaunt up Ben Ledi in the sun before a well-earned ice cream. Everyone was off their routes before the rain hit mid-afternoon. It was great to have an almost full hut, and also to see Rebecca P, Monty and t’other Clare who were all camping at nearby Kingshouse. Another splendid meet, thanks all.